This post focuses on how to convert/compress HD/4K/8K videos for new Apple smartphones iPhone 6S and 6S Plus with the fastest tool. Just like the predecessors iPhone 6 and 6 Plus, new Apple phones iPhone 6S and 6S Plus also come with 16GB, 64GB and 128GB capacities. At first glance, there's enough memory to store movies, video clips, music, pictures, apps, and no need to compress videos for iPhone 6S to save space. But it is not, especially if you want to shoot 4K videos with your iPhone 6S. In fact, a 16GB iPhone 6S will allocate a few gigabytes to iOS 9, leaving around 12GB of internal storage to store apps and other media files. And according to the official numbers in the iPhone 6S settings, a minute of video will consume '60MB with 720p HD at 30 fps', '130MB with 1080p Full HD at 30 fps', '200MB with 1080p Full HD at 60 fps' and '375MB with 4K at 30 fps'. A 30-minute 4K short video will almost run out of your space. So, if you want to keep more video clips on your iPhone 6S, you are suggested to turn the video size down. And this post will show you how to compress HD/4K/8K videos for iPhone 6S/Plus without significant quality loss using a professional video compressor. If you want to compress videos for iPhone 6S/Plus to save storage space or fluent playback, a video compressor is necessary. There are quite a lot of video compressors, among which WinX HD Video Converter Deluxe is highly recommended. Because it allows users to input any SD/720P 1080P HD/2160P 4K/4320P 8K videos in MP4, MKV, AVCHD, M2TS, HEVC (H.265), TOD, MOV, etc, and then convert/compress the videos to iPhone 6S/Plus and older iPhone models directly at much faster speed than any other tools by means of hardware acceleration. 2. Crop/trim video. Tap on Edit button, and then you will step into the video editing interface where you can trim video by setting start and end time to cut off unwanted clips, and crop video to remove black edges. >> How to Compress a Video on PC/Mac Free. How to Compress HD/4K/8K Videos to iPhone 6S/Plus? 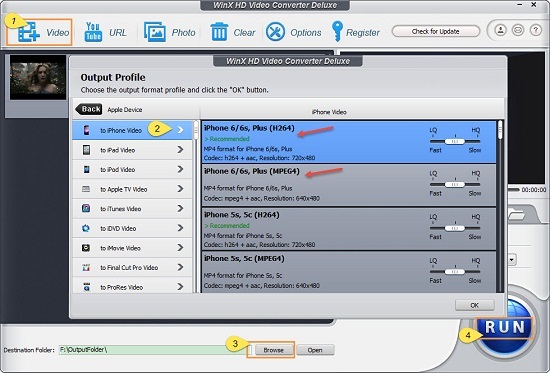 WinX HD Video Converter Deluxe is badly easy-to-use video compression software. After downloading and installing it, anyone can perform video to iPhone 6S/Plus compression or conversion effortlessly. Step 1. Run the compressor and import video(s). You can load one or more videos for compression by clicking "+ Video" or dragging & dropping. Step 2. Specify iPhone 6S/Plus as the output. On the Output Profile panel, find iPhone 6S/Plus profile following "Device Profile -> Apple Device -> to iPhone Video -> iPhone 6/6S, Plus (H264) or iPhone 6/6S, Plus (MPEG4)". If the default settings cannot address your needs, you can also change the video audio parameters or/and edit videos. Step 3. Set destination folder. If your iPhone 6S/Plus is connected to your computer, you can set a folder of your iPhone to save the compressed video(s). If not, you can specify a folder of your hard drive, and then transfer shrunk video(s) to iPhone 6S/Plus later. Step 4. Begin compressing video(s) for iPhone 6S/Plus. When all settings are done, you can hit "RUN" to get video to iPhone 6S/Plus compression started. WinX HD Video Converter Deluxe can not only compress videos for iPhone 6S/Plus, but also able to compress/convert almost all videos for other iPhone models like iPhone X, iPhone 8, iPhone 7, iPad Air 2, iPad Pro, iPad mini 3/4, Android HTC, Samsung, Kindle Fire, Sony, Windows phone, etc. In addition, it can compress videos for uploading to YouTube, Facebook and other websites.